Bauer Vapor X500 Ice Hockey Skates - 2017 - Junior is rated 4.7 out of 5 by 7. The Bauer Vapor X500 ice hockey skate comes close to the elusive sweet spot of high performance and affordability, attractive to intermediate performance-level skaters looking to enjoy a little bling without emptying their wallets. But the significant upgrades in the X500 aren’t just bells and whistles. Instead, improvements over the X400 add value to this mid-line Bauer offering by increasing the skate’s wearability and durability. The outsole in the X500 is an injected TPR with an indentation down the center for increased stiffness and a more efficient transfer of energy. The outsole is connected to the TrueForm Tech PU quarter package. The TrueForm offers a substantial increase in stiffness over the X400 model, and it is fully thermoformable—the internal foams and the outer shell will mold to the foot when baked, for a customized fit and feel, and maximum comfort. The quarter package also features Vapor’s signature X-rib design on the rear of the boot, adding more support and stability for a more comfortable and powerful stride. Finally, the X500 comes with Vapor’s one-piece heel and ankle core that works in conjunction with the X-rib for a longer lasting, higher performing boot. The tongue in this year’s X500 is a 40-ounce, two-piece white felt tongue with high-density injected center foams, providing excellent protection on the top of the foot against stray pucks and slashes. It’s especially useful in low-volume skates like the Vapors because the inserts offer additional protection against lace bite. The X500 skate interior features AnaForm ankle pads that are soft to the touch and form-fitting when baked. The liner is a hydrophobic microfiber that does a great job wicking moisture and sweat from the foot for dry comfort. The footbed in the X500 is a standard EVA foam bed that provides some nice cushion in the interior. One of the best upgrades to the X500 is the Tuuk Edge holder. The Tuuk holder has been the most popular blade holder in the NHL in recent years, thanks to its innovative trigger system, allowing skaters to change damaged or worn steel in seconds for more time on the ice and less time on the bench. The holder is also taller, so skaters can get further over their Tuuk stainless steel runner edges. The Bauer Vapor X500 offers performance-level intermediate skaters plenty of performance features. The popular Tuuk Edge holder and thermoformable materials will attract skaters looking for the best skate with high-performance features at an affordable price. Weight: 620 Grams Weight of the skate measured in Grams (Sr 8.0D, Jr 4.0D, Yth 12.0D). Holder: LightSpeed EDGE Type of skate blade holder. Runner: TUUK super stainless Type of skate blade. Tongue Material: Anatomical 2-piece 40oz felt with reinforcement Type of material and design of the tongue. Boot Construction: Reinforced Trueform tech TPU with X-Rib Type of material the product is primarily made of. Footbed: Molded comfort EVA foam Type/Brand of footbed in each boot. Rated 5 out of 5 by Davey from Amazing!!! My grandson wanted the lowest cost model. IMy son suggested the 300. I said lets go for the gold, the 500! My grandson was ecstatic and the 500 has given him that extra boost to out perform the other players! Rated 3 out of 5 by Brad from Good Skate Decent skate but be prepared to buy a new set of laces right away because the stock laces are terrible and fray within a week.would rate higher but no response from Bauer in that regard cannot rate it higher. Rated 5 out of 5 by Hockey grandpa from Great skates for the price Bought these for my grandson, he's worn Vapor X500's for several years and they've always performed flawlessly. Rated 5 out of 5 by DocPauli from Great Fit I purchased the these skates for my son and they are an almost perfect fit. Do I order skates by shoe size or skate size? You would be ordering the skate size online. The skate size is typically about 1.5 sizes below your shoe size. 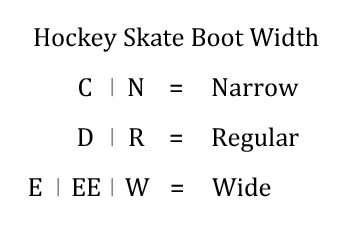 This means somebody with a 9.5 shoe would typically be an 8 skate. Thanks! my son is 10 years old with a size 6 sneaker any estimate as to what size skate he might be? 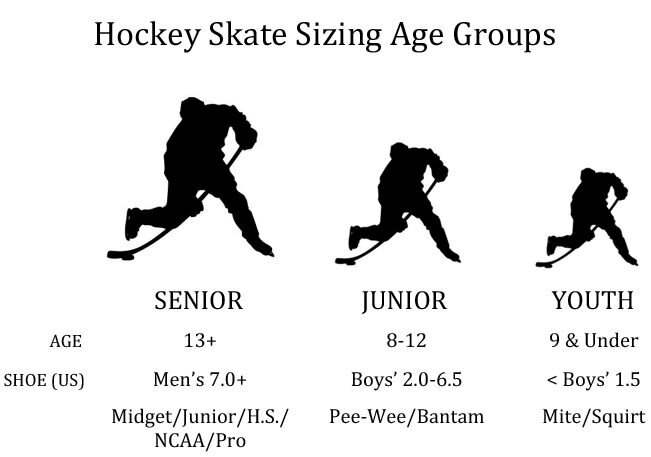 Skate sizes are typically 1.5 sizes down from the shoe size. It is always recommended to get your foot fit for skates by a professional.